Being one of the lowest priced epilators we reviewed we expected that there would be missing functionality or poor performance, however we were pleasantly surprised to find out that this model compared quite well to its higher-priced counterparts. The biggest downfall we found with this particular device is the fact that it is corded, and who likes cords in the wireless age?! Beyond the cord, epilating was a bit more painful than other models and we would not recommend it if you are a first timer (unless you have an affinity to pain). Read our full review breakdown below. We have broken our review up into five sections that highlight the different area of concern when purchasing an epilator: Price, Features, Comfort, Design and Warranty. The Epilady Speed corded epilator is one of the most affordable and popular models we have reviewed. With a MSRP of $54.95 and often on sale for less, it is easy to understand why it is such a popular choice. Compared to other higher priced models in the $100-$200 range this one can be considered a steal. The most likely reason it is cheaper is the fact that it is corded only and does not contain a rechargeable battery. 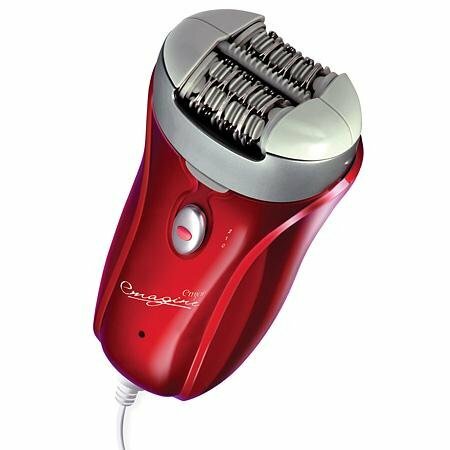 Corded: This particular epilator can only be used while plugged in which can be a bit of a hassle depending upon where you intend to use it. This, in our opinion, is the major drawback of this model. Two speeds: The Epilady Speed EP-810-44 has two operating speeds. At the higher speed the 20 pairs of tweezers give a staggering 31,000 tweezes every minutes; while the slow speed option is great for delicate areas and sensitive skin. Multi Zone Use: It can be used on all areas of the body except the eyebrows. This includes face, arms, legs, underarms and bikini zone. Angle Guard: An attachable guide helps give you the best results by keeping the device at a perfect angle to ensure the easiest use. Epilators in general are painful to use at first and this one is no exception. It it comparable with other brands however is a bit more painful and we would not recommended it for a first time users. If this is your first time using an epilator you may be inclined to spend a bit more to purchase one that is a bit more gentle. Beyond the pain aspect we found that the cord can get in the way while using the epilator and can affect the angle at which you hold it. The cord can also make it a bit more bulky for storage. Most competing models either take batteries or have a built in rechargeable battery which is very convenient. Holding the Speed EP-810-44 is comfortable and like other models it is not too heavy or unbalanced. While the angle guide attachment is on it is quite simple to keep everything at the right angle to achieve the best results with in the shortest amount of time. The design of the Epilady is quite similar to other handheld epilators. It has 40 tweezer discs (20 pair) that are capable of achieving up to 31,000 tweezes per minute on the high speed setting. The construction is quite solid and attractive with handy button locations. The warranty included with the purchase of this model is pretty generous and covers defects due to manufacturing. In order to register your warranty you will need to fill out the product registration card that comes with it and send it in. Then if you need to claim the warranty then you mail the product via insured post back to the address provided. This is another bargain priced model that does not disappoint. While not as impressive as higher priced models it boasts many of the features of the higher priced competitors such as a built-in rechargeable battery for cordeless operation, wet and dry use, and 3 additional attachment heads. 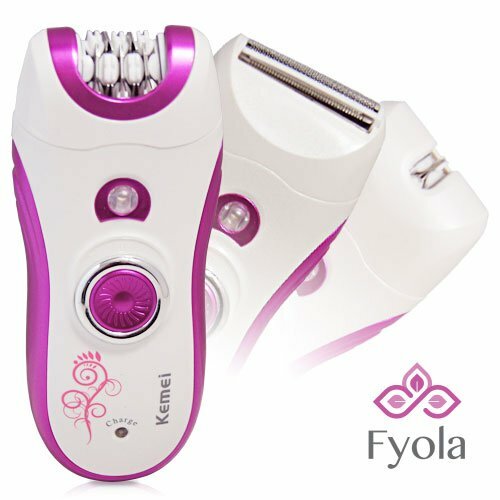 The downside of the Fyola epilator is that, like others that are low priced, it is quite a bit more painful than the more expensive models. If you are looking for your first device you may want to continue your search for something that is not as painful. We have broken our review up into five sections that highlight the different area of concern when purchasing: Price, Features, Comfort, Design and Warranty. The Fyola epilator is in the mid to lower range of pricing of the different models that we reviewed in our study. Having a MSRP of $59.99 and often sold much cheaper at online outlets it is certainly a contender for an entry level device. What makes the price even more attractive are the many attachment that are included with the Fyola 4-in-1. 2 Speed operation: This model has the industry standard 2 speed selection. The faster speed is for general use and the slower speed being recommended for sensitive areas or very fine hairs. 4 different, interchangeable blades: Included are 3 additional blades in addition to the standard blade. These different attachments are great for different areas of your body and being removable make cleaning up a breeze. Pivoting Head: This model features a pivoting head that ensures you are able to keep the proper angle for epilation and allows the Fyola to remove hairs as short as 0.5mm! Rechargeable: This is where this epilator really shines in comparison with the other cheap models on the market. Having the rechargeable battery allows you to be free of cords. The battery takes approximately an hour to charge fully and a full charge will last for around 40 minutes of use. Wet or Dry: You can use this epilator in the shower or on wet skin with no ill-effect or risk of electrocution. One of the things we found really neat in this rechargeable epilator is the pivoting head. This really made using it really easy on those hard to reach areas. The fact that it is cordless also adds to the comfort of use. The smaller facial attachment is really a great additional and is far more gentle than that standard attachment head. Unfortunately, like other bargain priced models, the Fyola 4-in-1 is quite a bit more painful than the higher priced models. If this is your first epilator we implore you to spend a bit more to ensure you will actually use it an not just stuff it in a drawer while cursing whoever came up with such a barbaric hair removal device. The appearance is quite appealing with a purple trim on white and the contraction feels solid in the hand. Beyond the basic design and appearance the biggest upgrade on this model is the different attachment heads which allow you to better accommodate the different areas of the body. There is no extended warranty for this product, however Fyola guarantee their products for 45 days from the date of purchase. If for ANY reason you are not satisfied with your purchase you can return your Fyola epilator for a replacement or refund. The catch is that you must return it with the original packaging, all attachments, have your proof of purchase, and pay for shipping. Considering the price you are probably better throwing it in the trash than paying for shipping both ways and waiting months. If you are looking for a high quality, full function epilator in the mid-price range that is gentle enough for a beginner; the Panasonic ES-ED90-P may be what you are looking for. It is a bit higher in cost than other bargain-prices models but it's additional features make the price worthwhile. With hypoallergenic nickel-free blades and a 'gentle' head attachment it is perfect for those with allergies or sensitive skin. Read our full review below! The Panasonic ES-ED90-P Wet and Dry epilator is in the mid price range of the models we tested with a MSRP of $89.99. While this is a higher price than some others on the market, there is good reason for this as it is of higher quality and includes more features. This is still not a top of the line model but is far superior than the more budget-friendly models. 60 degree angle head: Typically you need to hold an epilator at a 90 degree angle for it to work properly, which can be difficult when reaching certain parts of the body. Panasonic has overcome this by using a 60 degree head. 48 tweezing discs: Dual disc design with 48 heads ensures a close and comfortable shave and is more gentle than lower priced models for sensitive skin. Hypoallergenic, Nickel-free blades: Perfect for those with skin allergies or sensitive skin. Wet or Dry: 100% Waterproof for use in shower and with foams, gels or creams for a much smotther experience. Rechargeable & Cordless: The built in battery takes approximatley 60 minutes to charge and gets a stunning 90 minutes of use per charge. 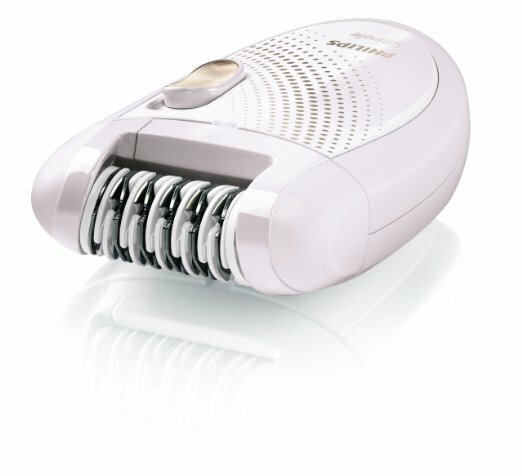 6 bonus attachments: A great assortment of attachments come with the with Panasonic Epilator. Included in the bundle: standard epilation head, epilation beginner cap, epilation gentle cap, foot care head, shaver head and bikini cap. 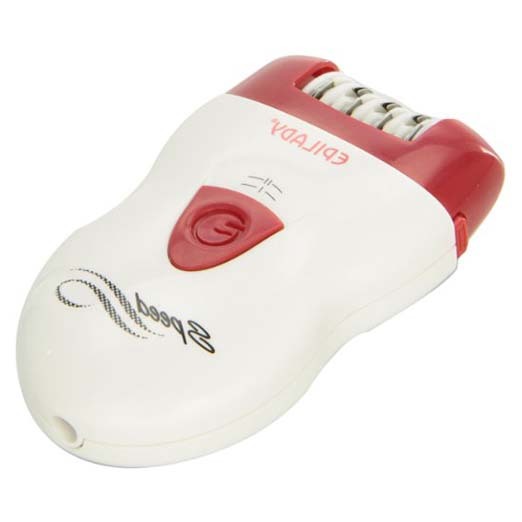 This is epilator is perfect for beginners due to its many attachment heads, 60 degree angle but where someone new to this type of shaving will probably appreciate the reduced pain from this device. However, like any brand it can still be painful the first time you use one. The ES-ED90-P is similar in shape and size as other brands and models and sports a pink and white exterior. It measures 1.6 inches thick, 2.3 inches wide and 5.3 inches long. The 60 degree pivoting head is a great design addition and makes it easier to use overall. The built in battery is of high quality and charges quickly and has an incredible capacity. The 100% waterproof design makes washing the unit after use a breeze. The Panasonic Wet and Dry Epilator has a very generous warranty that covers defects in materials and workmanship for a period of two years including parts and labor! Their service and repair process is quite strait forward and can be initiated by mail, phone, or even from their website. You will need to provide a proof of purchase/receipt for your purchase and send back all attachments. The prefer you send it back in the original carton however that will not prevent repairs if you do no have the box it came in. Similar to other bargain priced models this one is quite painful compared to other higher priced devices. If you are first getting started with epilating this is probably not the one for you since you will probably never try it again after the first time. The Philips HP6401 is in the lower price range of all of the brands we reviewed. With a MSRP of $39.99 and sold a bit cheaper online it is no wonder why it is a popular choice for people who are new to epilating. The price reflects it’s no frills and basic design, however it is still very much worth the money. Two speeds: Multiple speeds allow for use all over the entire body. The high speed is great for the legs and arms while the slower speed is more gentle for sensitive body parts. Efficiency cap: This wasnt really as great as they made it out to be. It is simply a plasic cap that covers a portion of the blades. However if you are new to epilation then it may help you hold the device at the proper angle. Removable, washable head: The head of the epilator is removable so that it can be washed directly under running water. Dry operation only: The Philips is a corded device and therefore can only be used dry. One of the things we found in common with all of the cheapest epilators we reviewed is that they were significantly more painful than the mid and higher priced models. This one was no exception. If you have never used and epilator or had waxing done on a regular basis then I suggest looking at spending a few more dollars and get something that will be more comfortable for you to use. Also, since it is corded there are times that the cord can get in the way while trying to reach parts of your body. The HP6401 Satinelle is of a very basic design and it doesn’t boast many features but what is there is constructed solidly. The grip is comfortable to use and the design is attractive and fairly gender neutral making it popular with men. Since it is a corded device there is no internal battery and it is controlled by a single switch. The single attachment that comes with the epilator, the efficiency cap, doesn’t really do much of anything but could possibly be of help to someone new to get the correct angle. Philips is a well known company and offers a 2 year warranty on all materials and workmanship for their epilators. It does not cover any damage resulting from accident, misuse, lack of reasonable care or abuse. You can initiate the warranty process by phone or on their website and will have to pay for shipping of the device. Of all the corded devices we reviewed, this one was our favorite! It was by far the most gentle of the mid to high priced models. The unique 72 staggered, dual opposed tweezer heads did a wonderful job of removing hairs by the root instead of breaking them, which resulted with very few ingrown hairs while the lifting finger got the stubborn flat and short hairs to stand up. Seeing how gentle this epilator was on the skin it would be a great candidate for beginners. The biggest downside of this device was the fact that it is corded and cannot be used in the shower or with gel, cream or foam. The Emjoi Emagine is in the mid to high price range of all the models we reviewed. It has a MSRP of $119.95 but typically can be found for much less online or on sale in stores. The value is found in all of the advanced features included on this model. 72 tweezer heads: By having a higher number of tweezing heads it removes hair quicker and more comfortably than other devices by reducing the number of rotations needed to remove the same amount of hair resulting in less irritation. Antimicrobial Protection: The first epilator in the world to use a silver-ion technology to prevent infection. Dual opposed staggered heads: The unique design and arrangement of the tweezing heads prevent ingrown hairs. Lifting fingers: Middle lifting fingers lift flat and short hairs to ensure an even and full shave. Dual Speed: Multiple speeds allow for comfortable use all over the body. Corded operation only: The AP-18 is a corded use only device so there are no batteries to replace or charge, however you can only use it dry. Unlike the cheaper priced corded models we reviewed, the Emjoi is actually very comfortable to use. It was far less painful than we had expected. Holding and using the device is comfortable in the hand but more importantly it is far more gentle on the skin. One of the major setbacks when using is the cord. Sometimes the cord can get tangled up around your body making it difficult to reach certain areas. Also due to it being a dry operation unit if you are used to using a foam, gel or cream while epilating it may be less comfortable for you. We really wanted to give this one a 10 out of 10 in the design department, however since it is corded and dry use only we just could not. The construction of this model is rock solid and the thought and features built in show that this company has really put the research and testing into the Emagine line of epilators. The ‘lifting fingers’ are really good at getting those stubborn flat hairs to stand up, while the staggered dual opposed heads maje sure to pull the hairs out from the root and not break them resulting in nearly zero ingrown hairs. Emjoi offers a fairly generous no hassle warranty on materials and craftsmanship for the period of one year from the date of purchase. Simply return the unit to their returns department within the one year period and they will either repair or replace it at their discretion. You will have to cover shipping to them but they will cover the return shipping. As with typical warranties, it does not cover accidents, mis-use, abuse, improper care, etc. This is the very best rated model we had the pleasure of reviewing. It is well designed, well built, and most importantly it is very gentle to use. 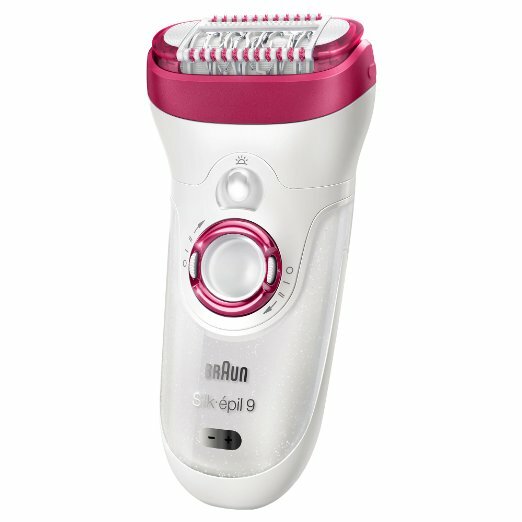 If you have never tried this type of hair removal before, or are scared of waxing then the Braun Silk-Epil 9 is the epilator that you want. No matter what part of the body it is used on you can expect comfort from the advanced features such as adaptive skin contouring and the 40% wider head. Read our full review below to see why we chose this model as our top pick! While the Braun Silk-Epil is the highest priced model we reviewed, it is also the best bang for your buck which is why it scored so high in this category. The MSRP is $129.99 and it doesn’t often sell too much cheaper online, however even at full price it is worth it. 40% wider head: A wider head than other models means that it removes more hair faster and more comfortably. MicroGrip tweezer technology: This is a patented technology that ensures proper feeding and plucking of hairs in a single stroke. Cordless & rechargeable: Built in battery takes about 1 hour to charge and lasts for approximately 40 minutes of use. Cordless operation mean no getting wrapped up in the pesky cord while reaching difficult areas. Wet & Dry: You can use the Silk-Epil 9 dry, in the shower, or with your favorite gel, foam or cream. Washing it off is a breeze since it is 100% waterproof. Pulsating active vibrations: Pulsing vibration helps stand short and flat hairs up for a even shave on the first pass. Adaptive skin contour: Automatically adjusting to the contour of your skin makes epilating your entire body simple, even for beginners. Built in light: A handy light is built into the unit that shows even the tiniest blonde hairs. Multiple Speeds: 2 Operation speeds allow for gentle and fast epilation. This was by far the most gentle and efficient model we reviewed. If you have never used one before or you have sensitive skin then the Braun Epilator is probably the best bet. The wider head with adaptive skin contour seemed to hug the skin while the pulsating active vibration fed even the shortest hairs into the MicroGrip tweezing heads. Cordless and rechargeable allows for use in the shower with foam to really create a gentle experience. Braun has really hit a home run with the design of the Silk-Epil 9. The unit is built solid and the features included are all well thought out and useful. Everything from the handy led light that shows all the hidden and nearly invisible hairs to the pulse vibrations that stand hairs up to be plucked with the microgrip tweezers; this device was built with thought and proper engineering. Braun offers a fairly standard 1 year warranty on materials, parts and workmanship. Should your unit break before the end of the year of your original purchase then you can call a 1-800 number and they will give you the address of the nearest service center for you to mail it to. You will have to pay for shipping. At their discretion they will repair or replace the device and return it to you at no charge. The warranty does not cover abuse, misuse, improper cleaning and other thing that warranties don’t normally cover. 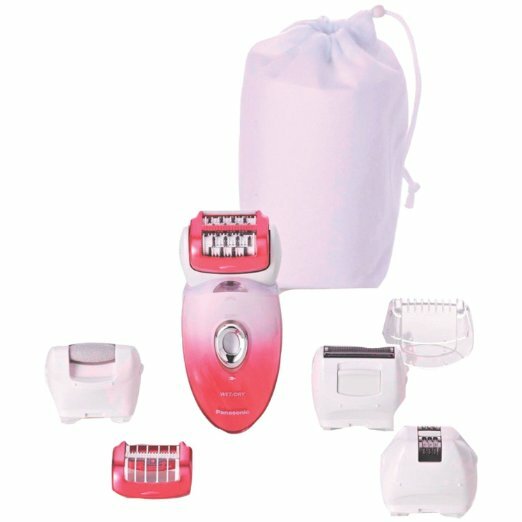 Epilator Reviews is a participant in the Amazon Services LLC Associates Program, an affiliate advertising program designed to provide a means for sites to earn advertising fees by advertising and linking to amazon.com.